For those who’ve never been in a production, the first rehearsal is all about housekeeping. Announcements, schedules, rules, expectations, contact lists, etc. and etc. We also received a nice overview from the designer, Greg Gillette, regarding what the set will look like and some of the costumes. 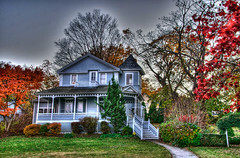 Director, Ann Wilkinson, provided some background to the play including some fun tidbits about New London Connecticut and the Monte Cristo cottage where the playwright lived (see picture) and provided the setting of the play. It was a great visual. Then comes the first read through in which you sit around tables and read straight through the script. Here I had the advantage of having known that I was cast and having read through the script a couple of times. Most, if not all, of the students were reading it cold for the first time. After rehearsal I received a quick tour from Alex Wei, one of the students on the production staff. I’ve known Alex for several years since I directed his mom in a production of Morning’s at Seven. I even got my own locker assigned to me (cue the nightmares of going back to school and forgetting your locker combination). I really enjoyed the excitement and atmosphere. It’s going to be fun to work with a great group of young actors. Only 25 rehearsals before the show has to be ready for cue-to-cue (yikes!). I have A LOT of lines to memorize in a short period of time. It’s strange to be in a show without Wendy involved in some way – we’re such a team. I was reminded last night that in the student lounge in the theatre department hangs a charter membership certificate for Central’s inclusion in the Alpha Psi Omega theatrical fraternity. My Grandpa Vander Well’s signature is on it from when he attended Central in the late 1920s. Kind of a cool legacy thing I’m quietly enjoying. I don’t think I have ever hitchhiked through Pella, Iowa, but my cousin and I drove down from Ames to watch his younger brother play in a football game at Central College (1987?). He played inside linebacker for Loras College; I think Central won the game. I know Central College won a national title in football back in the 1970s. Yep. Central was and is a big football school. I’m not a Central alum but my wife is. Pella is a unique place.